kapunda garden: January rain and garden produce. January rain and garden produce. It's been an unusual summer so far. After a warmer than average winter (despite one very frosty night in August) we had a long warm spring with almost no rain at all. The total rainfall for 2014 was about average, though most of it had fallen by the end of July. From August through December, we had very little rain and tanks were low, the garden suffered and on digging deeply into the soil, there was dust. 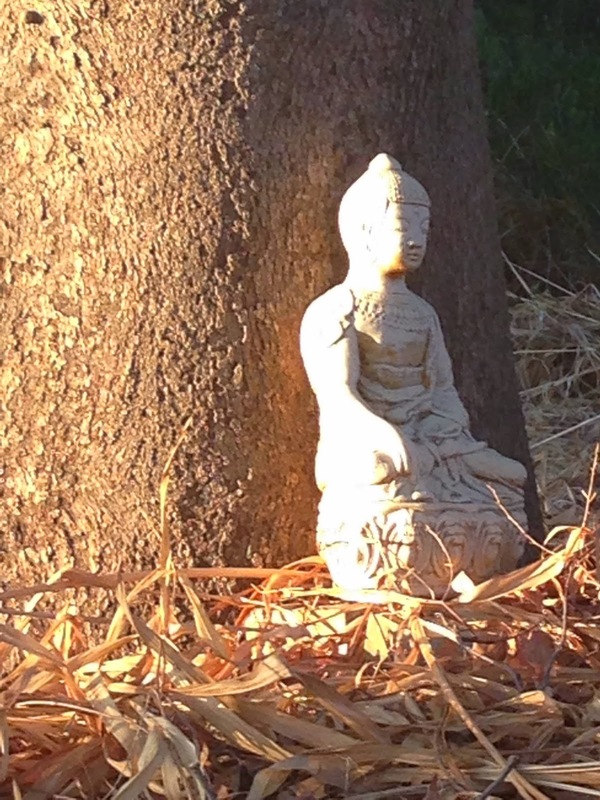 My front yard buddha has dry watsonia… even the weeds have died. Then, with the new year, we have had some good rainfall…. about 45mm in the first half of January. This came after a scorching week of 45C temperatures (113F) The rain is equal to half of the rainfall for the past five months (August - December.) January rain is not completely unknown, and like this episode, it is usually associated with monsoon rain that moves inland from the north. During the dry months, I continued to water regularly and most patches have survived though it is certainly not a lush as it was in the autumn (March -April- May) of last year. With this burst of wet weather and cooler temperatures, seeds have germinated and new leafy greens are on their way. Tiny silverbeet plants have come up incredibly quickly in the warm wet conditions. 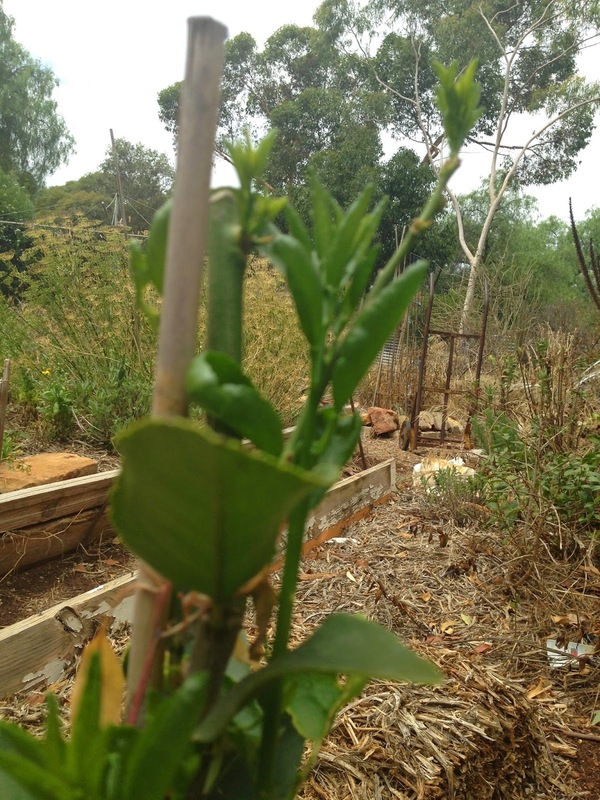 The lime tree that I planted about three years ago has sprouted new leaves…. In fact, I moved the tiny tree from the spot that I had chosen for it three years ago. It has been sitting there, apparently doing nothing despite the fact that I had watered and fertilised it, protected it from the very hottest days (with shadecloth) and from the very coldest days (with newspaper and baling twine.) It was just not happy in that spot. And so a few seeks ago, I moved it to its new spot. It had actually produced several new leaves prior to the rain but now… it has exploded into foliage… still small, but happier. … today, zucchini, kale, broccolini and eggplant. Dinner may well be "eggs and vegetables", perhaps homemade noodles with assorted vegetables (a sort of pasta primavera) or perhaps zucchini and lentil soup. When planning meals is done after picking the produce, you never know what you might get to eat for dinner, but I am certain that before supermarkets most people made decisions like this.